ATTN: I do ask that if you plan on utilizing this book or would like to contribute to the full publication of this book, PLEASE LEAVE A TIP. The purpose of this book is to guide the medical front office professionals through their important part revenue cycle management process. 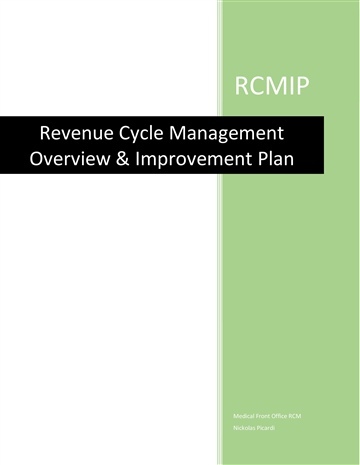 This book gives a quick overview and breakdown of the revenue cycle management process. Also included in is my four step improvement plan and a "Registration Accuracy Audit" template. The overall goal is to teach the front office staff how important their roles are, and how they can increase revenue for the practice. I would like to personally thank everyone for showing interest in my RCM book. I have spent countless hours gathering useful information from day to day procedures, and studying certain aspects that I know would benefit your practice. I graduated from Fortis College in Largo, fl in 2013 with a diploma in Medical Insurance Billing and Coding. Since then, I have been continuously studying the changes involved in the healthcare industry. I am currently billing in a Nephrology practice and have approved on multiple occasions to assist management with implementing plans and policies that I have written.